A paper just published in an obscure physics journal by the University of Waterloo’s Qing-Bin Lu (2013) has drawn quite a bit of media attention for blaming global warming not on carbon dioxide, but rather on chlorofluorocarbons (CFCs, which are alsogreenhouse gases). However, there are numerous fundamental flaws in the paper, which is based almost entirely on correlation (not causation) and curve fitting exercises. Lu’s hypothesis can be disproven very simply. He argues that the radiative forcing(global energy imbalance) from CFCs matches global surface temperatures better than that from CO2 over the past decade. This is because as a result of the Montreal Protocol, CFC emissions (and emissions of other halocarbons) have been flat over the past decade, and global surface air temperatures have also been essentially flat during that short timeframe, while CO2 emissions have continued to rise. However, a global energy imbalance doesn’t just impact surface temperatures. In fact, only about 2% of global warming is used in heating the atmosphere, while about 90%heats the oceans. Over the past decade, ocean and overall global heating have continued to rise rapidly, accumulating the equivalent of about 4 Hiroshima atomic bomb detonations per second (Figure 1). 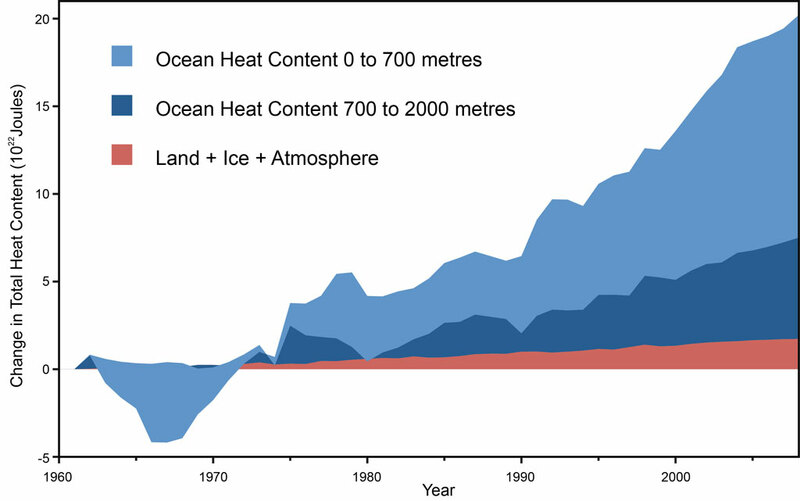 Figure 1: Land, atmosphere, and ice heating (red), 0-700 meter OHC increase (light blue), 700-2,000 meter OHC increase (dark blue). From Nuccitelli et al. (2012). So while CFCs might match surface temperature changes better than CO2 emissions over the past decade, CO2 emissions better match the relevant metric – overall globalheat accumulation. Since a global energy imbalance influences global heat content and not just surface temperatures, this by itself is sufficient to falsify Lu’s hypothesis. But let’s dig into the details of the paper to see how Lu built his case and where he went wrong. Here at Skeptical Science we have previously examined several cases of curve fitting. This describes the practice of scaling several variables without any sort of realistic physical constraint until the model closely matches the observational data, and then declaring that you’ve proven that those variables caused the changes in the observations. Loehle and Scafetta used this strategy to blame global warming on astronomical cycles, and Roy Spencer used it to blame global warming on ocean cycles. But Solanki and Krivova didn’t say TSI can be scaled willy nilly to fit the temperature data. They tried a similar approach in their 2003 paper simply to show that using the most generous possible assumption, solar activity still can’t explain recent warming (emphasis added). There is a proportional relationship between changes in TSI and changes in surface temperatures, but it’s a physical relationship. You can’t just choose whatever proportionality is convenient for your argument. In fact what Lu has done is assume thatTSI explains most pre-1970 global surface warming, and then claim that he’s proven this is the case. It’s circular logic, like fixing a card game and then claiming you’re a great card player when you win. The only reason Lu’s TSI model matches the surface temperature data is because he forced it to match through curve fitting – by refusing to apply any physical constraints to his model. Then when his unphysical model fits the temperature data reasonably closely, he declares that he’s shown “that the solar effect played the dominant role inclimate change prior to 1970.” In reality he’s shown no such thing, he’s simply assumed that his conclusion is true. Lu also uses a solar reconstruction from Hoyt and Schatten (1993) in his curve fitting exercise. Why use the results of 20-year-old study? Perhaps because it helps Lu arrive at his end conclusion that global warming isn’t due to CO2. The Hoyt and Schatten paper claims that the equilibrium climate sensitivity to doubled CO2 is a mere 0.19°C – a factor of 15 lower than today’s best estimates. Perhaps the gold standard of TSI reconstructions comes from Wang, Lean, and Sheeley (2005), updated by Kopp and Lean (2011), whose data are available here. They estimate that the increase in the amount of solar radiation reaching Earth from 1860 to 1970 was not very large (a radiative forcing of less than 0.2 Watts per square meter, compared to the 1.7 Watts per square meter CO2 forcing from pre-industrial times to Present), and only sufficient to account for approximately 0.07–0.15°C average global surface warming. Thus TSI can probably only account for less than half of the observed 0.3–0.4°C surface warming during that time, contrary to the 100% solar attribution Lu claims based on his curve fitting exercise. Lu faced the conundrum of having to explain how the increased greenhouse effect fromCFCs can cause global warming while the much larger increased greenhouse effectfrom rising CO2 can’t. To accomplish this, he used what the climate scientists at RealClimate have described as the saturated gassy argument – claiming that increasedCO2 can’t cause more warming because there is already so much in the atmospherethat its greenhouse effect has become saturated. However, as the climate scientists atRealClimate (and we at Skeptical Science) have explained, that argument is quite clearly wrong – disproven by observational data. Here Lu is again guilty of circular, unphysical logic. He doesn’t actually physically demonstrate why he thinks the CO2 greenhouse effect is saturated. Rather he merely argues that because CFCs seem fit the surface temperature data better than CO2, that means CO2 can’t be causing global warming, which means the CO2 effect must be saturated. Once again he has merely assumed his conclusion is true rather than actually providing physical evidence for it. And once again, Lu tried to demonstrate that CFCs can account for the recent global surface warming through unphysical curve fitting, multiplying the CFC forcing by whatever value allowed the CFC data to best fit the temperature data. When using physical constraints, CFCs (included in “halocarbons” in Figure 2) can account for only about 20% as much warming as CO2. Figure 2: Global average radiative forcing (RF) in 2005 (best estimates and 5 to 95%uncertainty ranges) with respect to 1750 for CO2, CH4, N2O and other important agents and mechanisms, together with the typical geographical extent (spatial scale) of the forcing and the assessed level of scientific understanding (LOSU). From the 2007 IPCC report. In his Figure 11, Lu also exaggerates the difference between expected CO2-caused warming and observed temperatures by plotting the observational data against the surface warming we expect at equilibrium. This is wrong because there is a global energy imbalance, which means there is more warming “in the pipeline” for several decades to come before we reach that equilibrium state. In reality the Earth has warmed as expected from the increased CO2 greenhouse effect. Why did the Media Cover this Paper? Frankly this paper should not have passed peer-review, but was perhaps aided by publication in a physics rather than climate journal, and in fact in the physics journal with the lowest impact factor by a wide margin. The paper was then trumpeted by aUniversity of Waterloo press release and a Science Daily article, both of which used exaggerated language like “Lu’s theory has been confirmed.” The Science Daily article did not discuss any of the problems with the paper that we have detailed in this post, or ask any climate experts about it. ABC did a better job, talking to climate scientist David Karoly, who expressed appropriate skepticism about a paper which purports to overturn decades and even centuries of well-established physics and climate science in one fell swoop. Characteristically, The Australian then criticized ABC for failing to be “fair and balanced” because they interviewed an actual climate expert about the paper. Moreover, this study isn’t new. It’s actually the third Lu has published about his CFCwarming hypothesis. The first two were addressed by RealClimate, two peer-reviewed published responses, Skeptical Science, and others. Andrew Gilkson at The Conversation, Climate Science Watch and Rabbett Run (here and here) are also good resources for debunking Lu’s latest effort. As we’ve previously discussed, the media need to be more careful in avoiding single study syndrome, misinforming the public by overhyping a single supposedly game-changing study before it has survived the scrutiny of the scientific community. I read Lu’s paper with great interest. I was starting to get optimistic based on claims made in the abstract and introduction. But although the model for polar ozone depletion seems likely, I think the correlation to warming to substances that deplete stratospheric ozone to be sloppy at best. I am sorry in a way because it would have been very convenient to be able to put the blame on something we already addressed. I think the main flaw was is lumping CFC, HCFC and CCl4 concentrations. It would have been far more instructive to use integrated IR absorption of these (and other) trace gases times their concentrations. There was no accounting of altitude-dependent pressure and temperature effects on absorption. Finally, a complete analysis would have included N2O, CH4, HFCs and PFCs. Concentration records for these are known (NOAA Boulder) as are the IR spectra. I suspect that Lu is a good scientist in the area of dissociatove electron detachment. But he certainly does not understand infrared radiation physics.